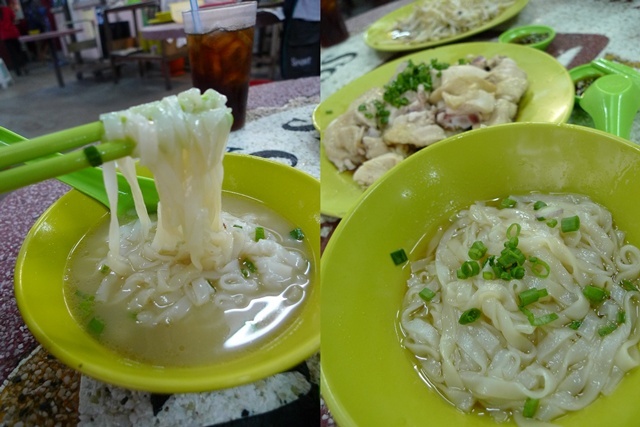 Ipoh is famous for the Tauge Ayam, or Boiled/Steamed Chicken with Bean Sprouts served with Kuey Teow (flat rice noodles). Names such as Lou Wong, or Onn Kee have garnered enough limelight/attention of their own, successfully placing them on almost all tourists’ must-eat list, and enough copycats to warrant a laugh (or snigger) or two. But if you’re wondering are those the BEST that Ipoh has to offer? Well, think again. 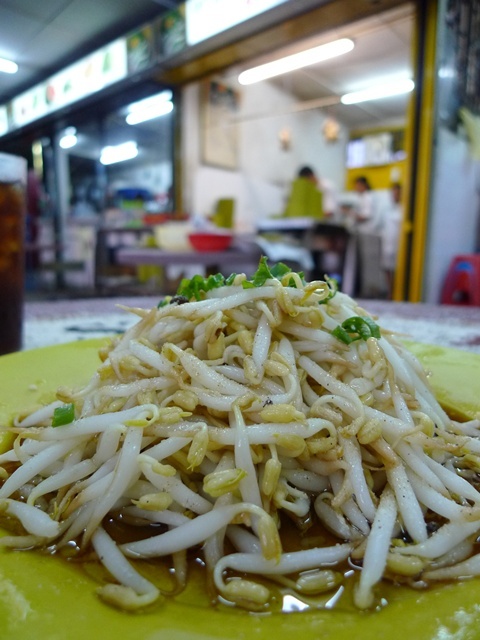 The fat bean sprouts of Ipoh. They say it’s the water that miraculously fattens the sprouts. What say you? Other worthy contenders such as Cowan Street Ayam Tauge & Koitiau (on Cowan Street/Jalan Raja Ekram) Got MAP!, Kam Hor at Ipoh Garden (MAP here), and this one, near to Buntong, but not quite. A portion for 3, not the smoothest chicken, yet thankfully not as RAW as Lou Wong’s. 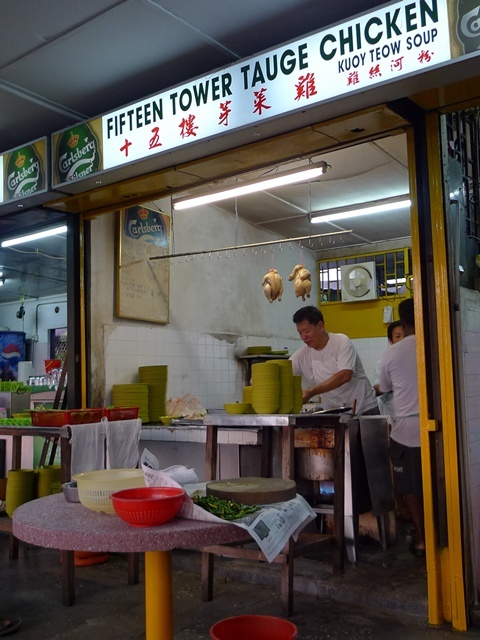 Fifteen Tower Tauge Ayam, situated at Pusat Makanan Zui Xiang Cun at cross between Jalan Tun Abdul Razak and Jalan Tun Perak, somewhere near to Buntong (where the Indian community dominates in Ipoh), and Medan Kidd (the former main bus station of Ipoh). The name of the stall probably refers to the nearby dilapidated 15-storeys flat in Buntong, visible from the food court itself. The place only opens for dinner, and highly advised to come early to avoid a long and restless wait. No TV to entertain your children, nor finger food to satiate that growling tummy. But there’s a satay stall which opens from about 7.30pm onwards, and another stall at the other end selling fried rice, noodles and such. The Wet and the Dry version of the Kuey Teow noodles. Simply garnished with chopped scallions, a dash of pepper, and liberal serving of the sweet stock. Notice the pale colour of the dry version? They were out of dark soy sauce. Hmm. Once seated, do not be anxious and walk over to order. They’ll come over and take your order, no matter how long it may take. No menus (duh), thus no need to crack your head on what to order and what not to order. 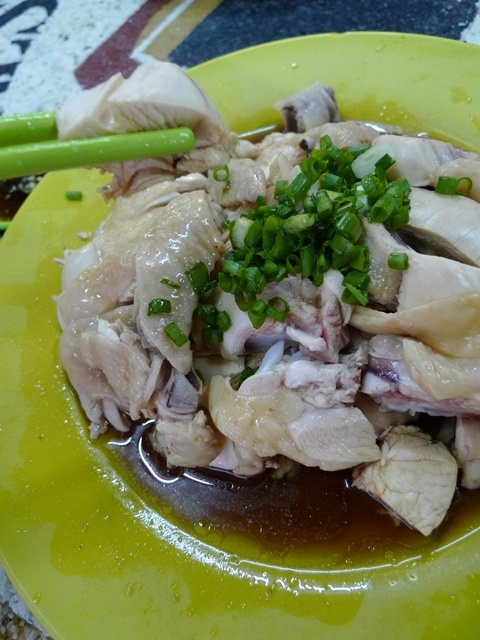 Just perform a simple head count, ask for chicken, bean sprouts, and side orders of chicken’s ‘spare parts’ (innards, offals, or whatever you call them) or braised chicken’s feet. We opted for the latter, but sadly they were not serving them that evening. Tastewise? The noodles are good. So smooth they required practically no chewing, and slithering down one’s throat with ease. The flavourful broth was no doubt boiled from the extras, bones and all from the chicken, and complemented the flat rice noodles perfectly. The dry version was equally good, if not better. A dash of soy sauce, sesame oil, some pepper, but without the usual dark soy sauce, my only gripe was the small serving. Yup, one or two mouthfuls, and voila! You’ll be staring at an empty bowl. No joke. The chicken on the other hand, was not as smooth though still tender & succulent enough. Not the best I’ve tasted,but previous horrifying experience at Lou Wong (with blood and all!) had me thanking the heavens above for the (slightly over) cooked chicken. Dinner for three came to RM17. Possibly one of the most economic option out there, and definitely one of the better ones in Ipoh. Now, I wonder why not many have blogged about this place before? Hmmm ….. If you need further directions to this one, feel free to ask. Slightly off the tourists’ tracks, this may be trickier than expected. But if you know where Ipoh’s railway station is, then this should be a no-brainer. Any idea where’s this place? NOT an idol’s villa. NOT my house, certainly! 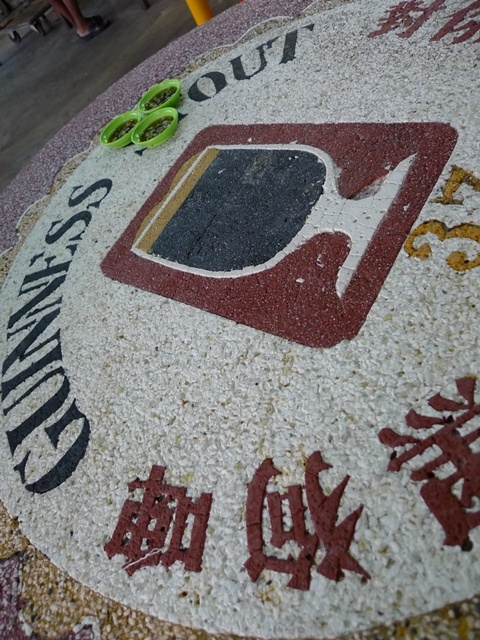 But a place for one of Buntong’s most famous product. Definitely will try to visit this place when time is right. Out of dark soy sauce? Like that also can? Ai yo, same like Xing Quan Fang?? Why Ipoh have such places like that kinda ordering system??!! ck lam : yeah, cz if you walk over, it seems to give the impression that you’re impatient, and exerting stress to the man. so better sit tight tight and wait. Little Inbox : haha … least healthier though. NKOTB : erm not all lah. these ‘superstars’ only. and i forgot to mention CANNOT TAPAU/TAKEAWAY ONE! The horfun is kid’s size! But good for those on low-carb diets 😛 I’d rather over- than under-cooked chicken anyday! And hey, your short post didn’t turn out very short after all! 550 ml jar of faith : didnt manage to shut myself up after the first few lines. aiyo … i am hopeless. iamthewitch : yeah, you’ll be left wanting for more. but ordering another bowl may take another 20 mins or so, so we didnt. allie : you dun like chicken? hahah .. funny. Huh, order like this ar? If they never notice u then no need to eat lor? oh! I like this unpretentious place-nice broth,smooth noodles and no soy sauce also never mind- lol! foodbin : simple, easy and cheap. Despite being an Ipoh girl born and bred I’m an oddity as I detest all things to do with tauge ayam, both the chicken AND the beansprouts. Used to shake my head in disbelief as friends and relatives practically begged to go to Lou Wong coz the chicken was soo bloody!! Hmm..looks like I’ve found an alternative. Funny how one can live in a place and not explore enough =D Thx 4 all ur food ‘education’. What do you mean by the last photo? Going into No.48 for stouts? Sad to hear that the 15-storey Tower is in dilipidated state. Lived there a number of years when young. Glad to hear the food nearby is good and cheap. Hey…motormouth! I havent’t been posting any worthy comments these days. I stayed in First Garden for 15 yrs but havent been there. According to my mom, this stall is related to Cowan Street NCK (Ngar Choi Kai). His brother apparently. And mind you…eerie story about Zui Xiang Cun location. Once there was some news that some people got into a fight there and a guy was slashed to death there. There you go. I prefer Cowan Street! The kuey teow looks smooth and silky. How come the kuay teow so little one?? Lou Wong’s chicken that bad? haha .. i love this post!!! funny and interesting!!! Their braised chicken feet are really good, way better than Lou Wong, Onn Kee or Cowan Street version. Or shall I say, (in my opinion) one of the best braised chicken feet in Ipoh, the other one being K10 Claypot Chicken Rice in Bercham. Oh…And it’s only ready from 8.30pm onwards. really good hor fun must be silky smooth…. what’s buntong’s famous?? guinness stout???! Joanna : you know, its rather typical for locals to not really sweat it out with the outsiders at tauge ayam shops. yeah, there was once, the chicken was so raw, the flesh was silver in colour, with reddish streaks! gill gill : thanks! i’m still discovering on my own. cariso : stouts? hahahah … not really. the house sells something else. worldwindows : oh you were from Ipoh as well? yeah, the flats look really run down now. Wen Xuan : yeah, they’re related, my fren told me.someone DIED? eerie stuff. and the place seems a bit unsafe as well, dark and infested with jaga kereta Indians. Food Paradise : it was indeed. Jencooks : name ah? i dunno Mandarin, so no idea. hahah .. the fifteen tower refers to the flats nearby though. Bangsar Babe : Lou Wong’s quality a bit inconsistent, I’d say. but given the fact that they’re the TAI LOW of all the Nga CHoy Kai, i think they cant care less. Dan : !!!! really that good? 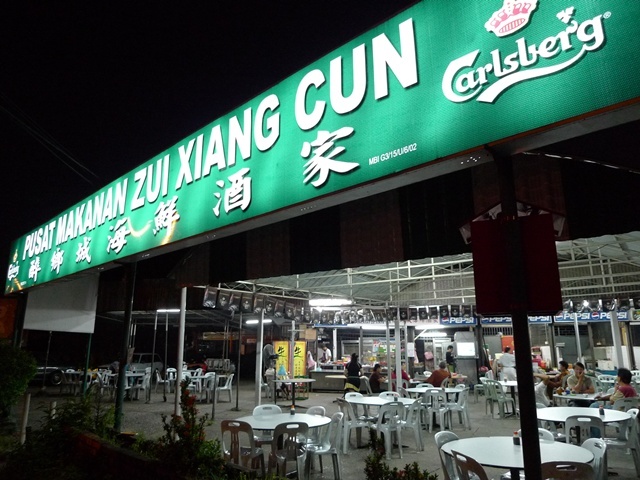 i’ve alwiz taken a liking to the braised chicken feet in pasir pinji, opens til late night. yeah, at this stall, they were saying something bout not ready yet. ling239 : yeah, with added oil. oooh …. YilingL : nolah … hahhaa… funny everyone got it wrong. Oh…The Pasir Pinji ones, is the stall selling Yong Tau Foo & Noodles as well? Corner shop? I remember going there for dinner quite a few times, but that was like 5-6 years ago. From my memory, the one in Pasir Pinji got a slightly thicker/stickier sauce base. But I would say they are equally good! Mmmm…seems like I must go to try the pasir pinji ones when I'm back! Dan : yeah! they’re facing the police station i think. i’m not a fan of braised chicken feet, but that shop was good. oh this is interesting, I must try, first time I hear about them thro ur blog! BBO : it’s my 1st time there as well. though i’ve been in Ipoh since … well, i was born! CUmi & Ciki : erm, YOU? hahahah …. but so true lah. Ipoh famous for pretty gals. just that pretty ones dont stay in Ipoh, thats all. Vincent : nice to see your interest. but i dun even cook, so its a bit off, eh? the best in ipoh, in my opinion. i love their service, and the way the uncle tends to the chicken, full of love. haha. theuptownlife : really? coincidentally, Cowan St’s was closed yday. on Mondays perhaps. thought of comparing. I like yr food blog very much. Well, I have tried this stall last year, their soup taste so sweet, as if they have added sugar. The price is not tht so economical in Ipoh standard. Won't be backed for more, that is all I could say. i knew this stall since i was small.. have been sometime never been there..
i was oso wondering why it is not as famous as lou wong and on kei… finally it was being blogging..
Hi. Great job on covering this shop. I prefer this one to others in ipoh anytime anyday. Also, you forgot to mention one of the special chicken feet dish of this stall (don’t know what it’s called in english though). It’s only available from 8pm onwards. Hi James, this place has been around for ages. In case you’re wondering, the owner and Cowan Street’s are brothers. Hence the similarity, but this one operates from a rather disdain food court, while Cowan Street’s tauge Ayam has their own shop. And their brand of tauge ayam actually existed long before the Lou Wong-Onn Kee debacle. So there … I am not old enough to figure this piece of history out, but the stalls under some trees along Cowan Street back in those days should be decent enough as proof of this claim. Hi, i personally think this is the best tauge chicken in ipoh. Despite the not-very-hygienic environment, i think they serve the smoothest chicken and keuy teow. If you are a fan of chicken feet, do not hesitate to try them out. This is my favourite place to have chicken feet but be aware that they will only be served some time after 8/ 8.30pm. Fifteen Tower Tauge Ayam in Ipoh, I believed is already closed since don’t know when. 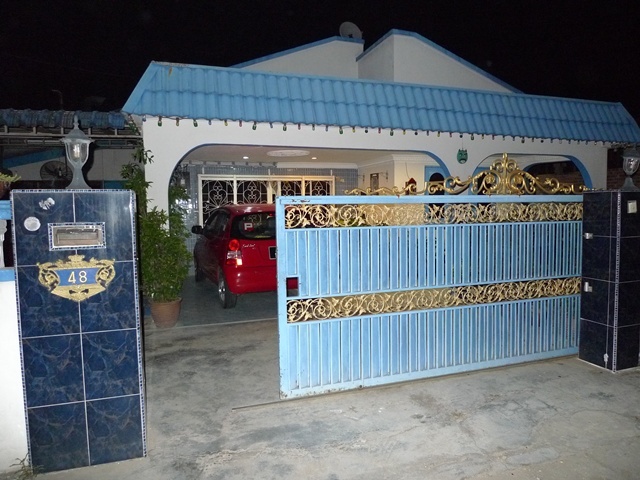 Last week just back to ipoh, pass by that area almost every day and night. Just wondering are they closed or moved to new outlet, any updates? The whole place is closed for rebuilding I guess. Can i know where they had moved to? Any idea where they had moved? Anyone of you know where is “Fifteen Tower Tauge Chicken ” had Moved ? This placed no longer exist… tear down few months already. Does anyone know the new location? I also want to know where they had move to??? I also want to know where is the new place now? i heard from the boss (in the last day business before the building tear down, August 2013) mentioned, they would open back business in the same location probably after 6 months (Feb 2014, after CNY), but it seems like there is no more construction in this place? so where is 15 tower now? i missed their taste!!! I also Miss It very much.Did anybody know where they are.Please help.